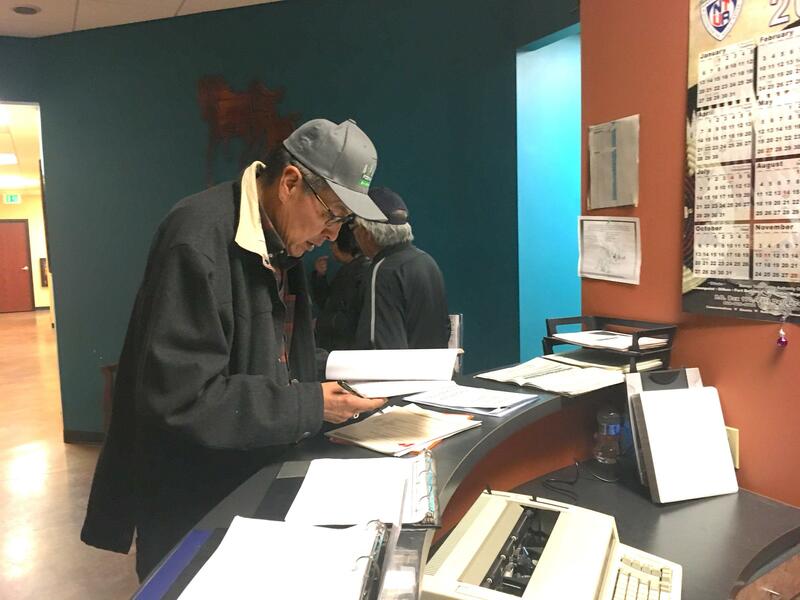 Following a contentious 2018 election, the San Juan County Commission includes Bruce Adams, Kenneth Maryboy and Willie Grayeyes, who were sworn in on Jan. 7. MONITCELLO — San Juan County reached an historic milestone earlier this month when a Native American majority assumed control of a county’s governing body — a first for Utah. After years of a white, Republican-dominated commission, the 2018 election brought not only a shift in political power but also legal controversy about gerrymandering and the residency of a commission candidate. Now, the three-member commission’s challenge is navigating a landscape already simmering with racial tension. Republican Bruce Adams took the oath of office for his fifth term as a San Juan County commissioner on Jan. 7. The commission majority is now comprised of Democrats Kenneth Maryboy, who previously served a commission term through 2014, and Willie Grayeyes, best known as a leader of the nonprofit Utah Dine Bikeyah, which led the Bears Ears National Monument campaign. I have absolutely no problem with there being a majority of Native Americans on the commission. I am a little concerned about the process that happened to get them there. 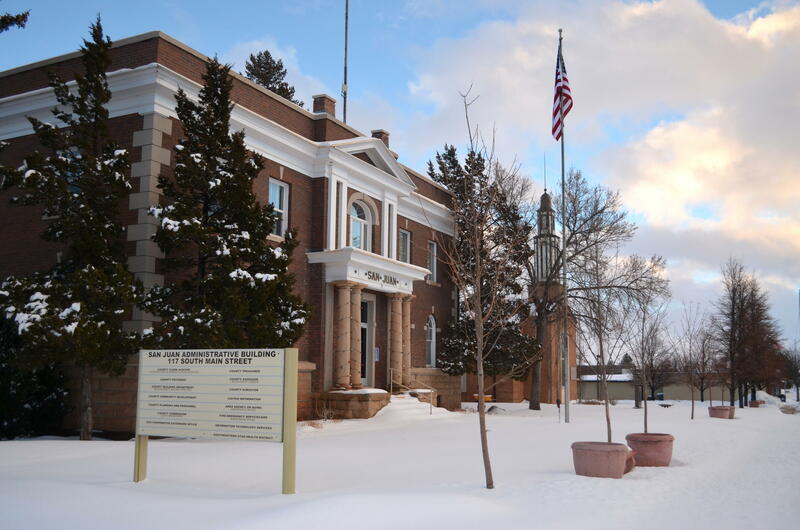 At their swearing-in ceremony in Monticello, the commissioners each pledged to serve all citizens of San Juan County — whether they live in the white communities in the northern part of county or south, within the Navajo Reservation. And, following their inauguration, Maryboy and Adams reaffirmed their desire to minimize friction and get the people’s work done. “I would be much happier if we could get along and work together to try and make life better for both the Anglo community and the Native American community,” said Adams. Maryboy agreed that working together is essential if the county wants to deliver basic services and reverse a three-year budget deficit. Commissioner Bruce Adams makes a 60-mile loop around northern San Juan County to feed and water cows and horses every morning. He's also beginning his fifth term on the county commission, which has just seen a dramatic and historic power shift. “I think that's the only way to kind of venture into this new healing — to work with one another and try to understand one another and respect one another,” he said. The commission’s charge is challenging to begin with. San Juan County, which is almost the size of New Jersey, has run a budget deficits the past three years while trying to serve fewer than 2 people per square mile. The county’s $12.8 million spending plan covers everything from law enforcement to libraries and emergency services to meals-on-wheels. Roadwork might be the most complicated chore. The county is responsible for 1,600 miles of paved, gravel and dirt roads. Some lie within the Navajo Reservation, which spans the southern boundary along the Utah-Arizona line. In Kenneth Maryboy's new role on the three-person San Juan County Commission, he’s helping tilt the balance of power to Native American Democrats from what’s traditionally been white, Republican control. He also leads a Navajo Nation community council on the Utah-Arizona line. Building a long-desired road to connect the communities of Navajo Mountain, in the county’s southwestern corner, to Oljato, about 22 miles east, would cost around $53 million, Adams said. The road spending is budgeted at $4.4 million annually, more than one-third of the county’s budget. But more than anything, boundaries — political and geographic — are expected to continue being the most divisive issue for San Juan County under Native American majority control. That’s because of a federal court ruling intended to end racial gerrymandering. In 2016, U.S. District Court Judge Robert Shelby ordered new boundaries that better reflect the county’s Native American majority. Those new boundaries led to the election of a second Native American, Grayeyes, in November. Now, many whites in San Juan County accuse Shelby himself of gerrymandering the commission districts so the county’s largest city, Blanding, might never again have a seat on the commission. Meanwhile, Grayeyes continues to face legal challenges over his eligibility for the commission. Opponents, like Grayeyes’ white, Republican challenger in the 2018 election, say he does not reside at Navajo Mountain, as he claims. They say he doesn’t even live in Utah – he owns property in Arizona. At the end of last month, the Republican Kelly Laws sued Grayeyes in civil court on the residency question. And, just like that question, the boundaries of the Bears Ears National Monument remain a lingering source of festering racial controversy. Monticello, one of two Mormon pioneer communities in San Juan County, is the county seat. 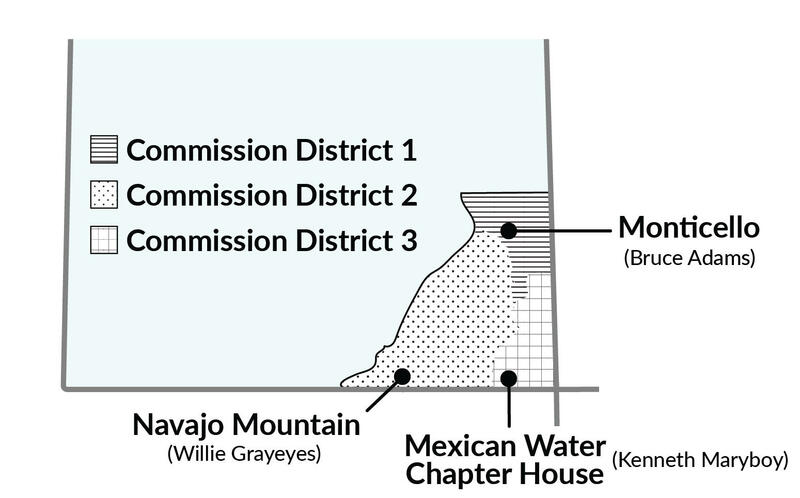 Continuing dispute over commission boundaries and a new Navajo Democrat commissioner seems to keep racial tension simmering. Navajos were part of an unprecedented coalition of five tribes that originally proposed a national monument of 1.9 million acres to President Barack Obama. Weeks before leaving office in 2017, Obama used his powers under the 1906 Antiquities Act to enhance protections for 1.35 million acres. The land, already under federal control, is filled with Native American antiquities and sacred cultural sites. Obama’s proclamation declaring the national monument recognized that by taking the unprecedented step of giving the tribes a hand in managing the monument. The previous county commission joined forces with other leaders in Utah’s GOP-dominated state politics, to condemn the national monument as federal overreach. Eventually, the opponents persuaded President Donald Trump to shrink the monument by 85 percent. Environmental groups were singled out as one of the “outside forces” driving the Native Americans’ agenda. We are more than environmentalists [Bears Ears] is who we are. That's part of us. Fighting the monument boundaries and the commission districts has already cost the county nearly $2 million, according to the San Juan County Administrator Kelly Pehrson. Neither dispute is going away anytime soon. The Trump boundaries for Bears Ears are being challenged by environmental groups and the tribes in U.S. District Court in Washington, D.C. Meanwhile, the county has challenged the commission-district boundaries to the 10th U.S. Circuit Court of Appeals in Denver.